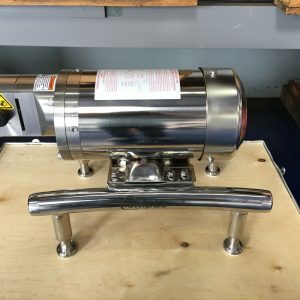 Rotary Lobe Pump Units Archives - Powerflo Products, Inc.
Powerflo Products Inc., located in Cypress California, designs quality Vogelsang pump and motor packages custom built and engineered to meet your specific pumping conditions and requirements. 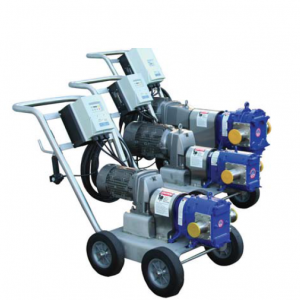 Vogelsang Rotary Lobe Pumps are available in many styles and capacities. 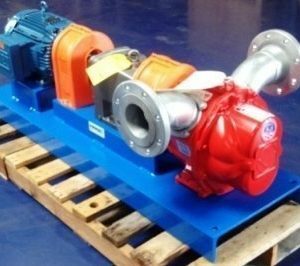 We offer low flow, high volume pumps up to high flow and high pressure models. A wide variety of materials of construction is available for maximum chemical and system compatibility. Vogelsang Unit Pictured: 304 Stainless Steel Wine Cart, capable of up to 65 gpm up to 65 psi, including a Vogelsang 316 stainless steel HiFlo Wine Pump, equipped with NBR elastomeric lobes, mounted on the cart, a 5 HP NORD geared invertor duty motor, a 5 HP 480 volt VFD Drive, including a Speed pot and cable, a 50’ 14/4 power cord, and 2.5” Tri Clamp flanges in 304 Stainless Steel.